Republican vice presidential candidate Sarah Palin called on Wednesday for a "clean break" from the Bush administration's energy policies, which she says rely too much on importing foreign oil. In her second policy speech in a week, the Alaska governor said the recent drop in gas and oil prices shouldn't deter consumers and lawmakers from seeking alternative energy sources. She cast energy independence as a national security issue and said dependence on Middle East oil leaves the U.S. more vulnerable to terrorists. "We not only provide wealth to the sponsors of terror, we provide high-value targets to the terrorists themselves," Palin said. "Across the world are pipelines, refineries, transit routes and terminals for the oil we rely on. And al Qaeda terrorists know where they are." Despite Palin's attempt to distance McCain's energy policies from those of the Bush administration, McCain's energy plan largely mirrors the priorities President Bush has pushed for eight years, especially more domestic production. Mr. Bush called for expanded offshore oil and gas drilling long before McCain reversed course to endorse added offshore drilling this summer. Mr. Bush has gone farther than McCain by supporting drilling in Alaska's off-limits Arctic National Wildlife Refuge. Palin did not mention the Alaska refuge Wednesday. McCain, like Obama, opposes opening the refuge to oil companies, but Palin has supported drilling there. McCain says nuclear power is key, to meet future energy demand. Mr. Bush too has argued repeatedly for expansion of nuclear energy and like McCain - supports federal loan guarantees for new reactors, construction of a nuclear waste dump in Nevada and resumption of reactor fuel reprocessing. Mr. Bush and McCain also have been in lock step on oil industry taxes: Both oppose Democratic efforts to impose a windfall profits tax on the largest U.S. oil companies. Palin spoke after touring Xunlight Corp., one of a handful of solar technology startup companies in Toledo, a struggling industrial city in this swing state. The city's leaders are hoping that the solar companies will create jobs to replace some of those lost by downsizing in the auto industry. But Palin made only a passing reference to solar power in her speech and instead renewed her call for more drilling in U.S. coastal waters. She repeated her signature anthem, "drill, baby, drill," which seemed to fall a bit flat on the audience at the plant even as it's become a popular chant at her rallies. Palin also called for the development of clean coal technology and said she and GOP presidential candidate John McCain would press for the construction of 45 new nuclear power plants by 2030. Palin said she and McCain believed in an "all of the above" approach toward weaning the U.S. off its dependence on foreign oil and criticized Democrat Barack Obama for being slow to embrace offshore oil drilling and nuclear power. "As John McCain has observed, for a guy's who's slogan is 'Yes, we can,' Barack Obama's energy plan sure has a whole lot of "No, we can't,"' she said. Obama has signaled a willingness to explore limited offshore drilling and has said nuclear power is essential to helping meet U.S. energy needs while raising concerns about how to store nuclear waste safely. Last week, Palin gave her first policy speech, on special needs children. 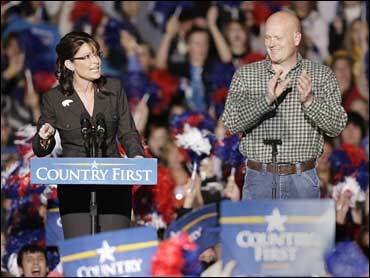 This speech sought to highlight Palin's background in energy issues. As governor, she pushed for $250 million in renewable energy research and an additional $60 million in rebates for Alaskans to make their homes energy efficient. She crafted her reformer image by standing up to oil-influenced corruption in the Republican Party and by pushing through legislation on a natural gas pipeline - something her predecessor failed to do. In Toledo, Palin spoke of fighting the Alaska political establishment and big oil companies, which she said colluded to block the development of a natural gas pipeline that she subsequently helped to develop. But her speech oversimplified the pipeline project. There's no guarantee the 1,715-mile pipeline will ever be built. Even if it's not, the company selected to lead the project could still receive up to $500 million in state subsidies. And while Palin did stand up to big oil companies to get a pipeline deal, an Associated Press review recently found that the bidding process was flawed and narrowed the field to a pipeline company with ties to Palin's administration. Palin took a shot at Alaska Sen. Ted Stevens, a Republican who was convicted Monday on federal corruption charges. "As you may have seen in the news this week, Alaska's senior senator is not the first man to discover the hazards of getting too close to moneyed interests with agendas of their own," she said. During a rally in Bowling Green, Palin was joined by "Joe the Plumber" - Ohio resident Samuel J. Wurzelbacher, whose exchange with Obama about taxes and "spreading the wealth around" sharpened the Republican campaign's focus on the Democrats' tax plan.